University researchers in China have completed testing on a new, autonomous unmanned mini-submarine, Chinese state media reported. The reports said that researchers at Tianjin University completed a sea test of the Haiyan, an autonomous underwater unmanned vehicle (UUV). “During the test, the vehicle worked consecutively for 21 days and reached a depth of 1094 meters. With an endurance of 30 days, the torpedo-shaped vehicle propelled at a maximum underwater speed of close to 6 kilometers per hour,” the reports said. The Haiyan is currently being developed as a civilian vessel for the purposes of scientific exploration of marine biology, seabeds and to aid search and rescue missions. 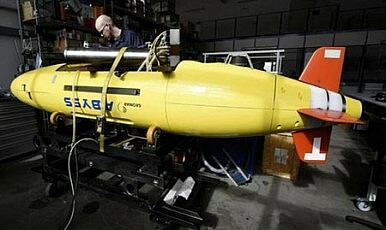 Indeed, the U.S. famously deployed the Bluefin-21 UUV to aid in the search for Malaysian Flight MH370. The Bluefin-21 was able to scan most of the immense search area in the southern Indian Ocean in nine missions. The Haiyan is not China’s first UUV. In fact, Beijing already maintains larger and faster UUVs. Where the Haiyan does have an edge is that it is an underwater glider which conserves energy and thus heightens endurance. It also has more advanced computing and can transport information in real time and even make decisions about which course to follow in the sea. Although being developed for civilian uses, research universities in China and elsewhere maintain close links to the national military and the Haiyan is likely to be used by the People’s Liberation Army Navy — perhaps even in a modified armed version. The Haiyan’s potential anti-submarine warfare (ASW) applications are likely to be especially useful for the PLAN as this is an area where Beijing has traditionally struggled. China’s perceived ASW weakness is being exploited by rival navies in Japan, Vietnam and the United States. Attack submarines would be key, for instance, in any American attempt to eliminate China’s anti-access/area denial capabilities. The Haiyan could provide more immediate utility for China. Chinese media outlets have alleged that Vietnam is using combat divers (frogmen) to try and disrupt operations surrounding the Haiyang Shiyou 981 oil rig in the South China Sea. According to Want China Times, some Chinese media outlets have speculated that the Haiyan will be deployed to try and detect these combat drivers and other special forces being used by adversaries to disrupt Chinese activities in disputed waters. It seems highly unlikely that the Haiyan will see action during the current dispute with Vietnam over the oil rig, but it certainly could see action in the future in the South China Sea.